Thirty-some summers ago, when I was a kid taking swim lessons, I had a very rude experience, courtesy of the high-dive at my local pool. All that summer I’d been an enthusiastic swimmer, sticking my face under the surface, venturing into the deep end, and even getting past that natural animal fear of climbing up a ladder then leaping into the open air. Then, one day on the high-dive, something went wrong. Just a little wrong, mind you — despite what some people may think from time to time, I didn’t plummet head-first into the concrete. Instead, as I was jumping from the board, I twisted just a little bit — perhaps I was indecisive about entering the water head- or feet-first, and gravity did its thing while I was still making up my mind — and I hit the water surface in full belly-flop. It was the kind of smack that makes you instantly lose your breath from the shock and the shame, and even from under the water I could hear all the other kids and the instructors let out an “ooh!” in unison. For a novice drinker, the first taste of Campari is akin to a belly-flop at the bar. As partisans on either side of the great Campari gap would no doubt agree, this Italian bitter is, to put it gently, an acquired taste. An enticing garnet color in the glass — making one think of gentle, welcoming drinks such as Port or Marsala — Campari shocks the taste buds with an instant and complex bitterness. After the first taste, the flavor lingers with various levels of brisk dryness, teaching you with every corner of its nuanced flavor that there are many more forms of bitterness than you’d ever previously imagined. I first tried Campari while backpacking around Europe at the age of 20. At the time, my tastes ran no more exotic than lager, and the sip of Campari came as an assertive slap. It’s only been over the last few years that I’ve forced myself to come to terms with Campari’s distinctive flavor, and only this summer that I’ve come to truly crave it. Part of the credit for this Campari satori goes to a modern classic cocktail called the Jasmine. First created by Paul Harrington, a master bartender-turned-architect, the Jasmine is a complex and refreshing mixture that tastes surprisingly like grapefruit juice. 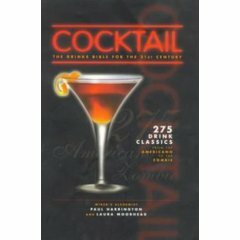 As Harrington relates in his indispensible yet woefully hard-to-find bartending guide, Cocktail: The Drinks Bible for the 21st Century (written with Laura Moorhead), he created this drink for a regular customer named Matt Jasmine while working at the Townhouse Bar & Grill in Emeryville, California. Inspired by the classic Prohibition cocktail, the Pegu, Harrington used gin as his base spirit then added lemon, Cointreau and Campari, and served the mix straight-up with a twist of lemon. Don’t let the drink’s appearance be deceiving — as Harrington notes, “Put a pink drink on the bar, and everybody wants one. They think it’s a Cosmopolitan — then they make a face when they taste it.” But unlike Campari cocktails such as the Negroni and the Americano, in the Jasmine, Campari’s assertive bitterness is happy to let someone else drive. The Cointreau nicely counters the bitterness without overly sweetening the drink, and the lemon helps keep the edges sharp, so after finishing a Jasmine, you’re ready to proceed to dinner. The Jasmine isn’t, strictly speaking, a summer drink — I can see being perfectly happy with one at most any time of year. But it’s a drink I first encountered in the summer (a couple of years ago), and it’s the drink I’ve become very fond of this summer, even having the luck to have been served one (a small, taster cup of one, at least) by Harrington himself, at Tales of the Cocktail in July. For this Mixology Monday, I chose the theme, “Goodbye, Summer,” and I can think of no cocktail I’ve learned more from or enjoyed more this particular summer than the Jasmine. Shake with cracked ice until very cold, strain into chilled cocktail glass and garnish with a lemon twist. Pucker up. Did I say Mixology Monday? Yep, it’s that time again — if you haven’t already, send your contribution my way (just stick a link in the comments section), and I’ll be putting together a wrap-up promptly. The Jasmine is a great one. Fitting that I should read this while drinking Campari (w/blood orange juice). I swear I didn’t know! The Jasmine is one of my most favorite drinks. I hope I attributed properly. In any event, this drink has been a hit and a good “gateway drug” into Campari. I also tried it with Aperol, and it may have been even better…worth a try.